Fielding and Platt began to manufacture Gas engines in about 1880 and also gas suctions plants, these early models worked with hit and miss governors. Mr John Fielding developed and patented a very ingenious graduated governing system which controlled the lift of the gas admission valve and provided only sufficient gas on each stroke to match the load on the engine, for this design he gained the Gold Medal at the Brussels Exhibition 1896. 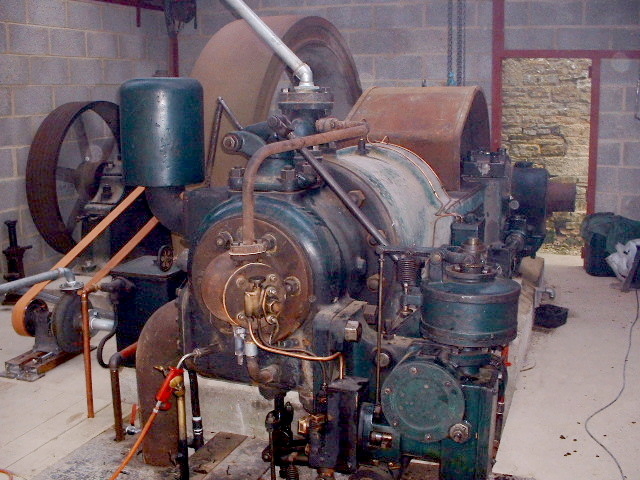 John Fielding also developed electric ignition instead of hot tube which was generally used, unfortunately this was not reliable because at the time insulation materials would not stand up to the high temperatures. Shortly after, low tension magnetos were fitted with moving contacts for the spark, this proved very satisfactory and was used on all F&P gas engines until they stopped their manufacture. During the early years a small range of engines which varied in power from 3hp to 8hp using hit and miss governing and hot tube ignition before, later changing to electric ignition and having a compression pressure of 80psi. About 1904 a similar range of paraffin engines was introduced with 80psi compression; injection of fuel took place on the suction stroke, some larger engines were made of this type up to 25hp. By the turn of the century, F&P were producing gas engines of 100hp and had developed a standard range of engines from 7½”bore x 13” stroke producing 13hp up to 19” bore x 27”stroke producing 140hp. By about 1910 the crude oil semi-diesel was developed, compression 250psi with a hot bulb pre-heated with a large blowlamp to start, this took 20 minutes to 1/2hour. In 1921 a tube was fitted to the vaporiser which could be heated with a painters blowlamp in about 10 minutes. By 1922 oil engines had almost superseded gas and very few gas engines were produced after 1924 by which date F&P had developed cold starting oil engines with compression of 350 PSI and all but the very small engines had compressed air starting gear fitted. 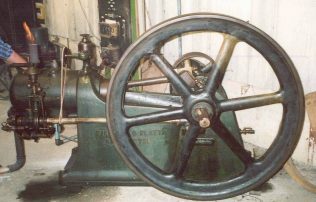 A smaller range of 6½” bore x 13” stroke was made which had twin flywheels and these could be started by hand, the speed was 360rpm and it developed 13hp. By 1928 a small high speed vertical was brought out at 5½” x 10” at 500 rpm also hand starting and a range of vertically enclosed 2,4 and 6 cylinder engines of 8½”bore x 14”stroke at 400rpm which developed 50hp, 100hp, and 150hp respectively. This about covers the complete range except the fact that about 1910 F&P built a small number of vertical petrol engines which are very similar to Lister engines of the period having a 4” bore x 7” stroke and carrying the name “Fielding Motor” cast into the crankcase cover. 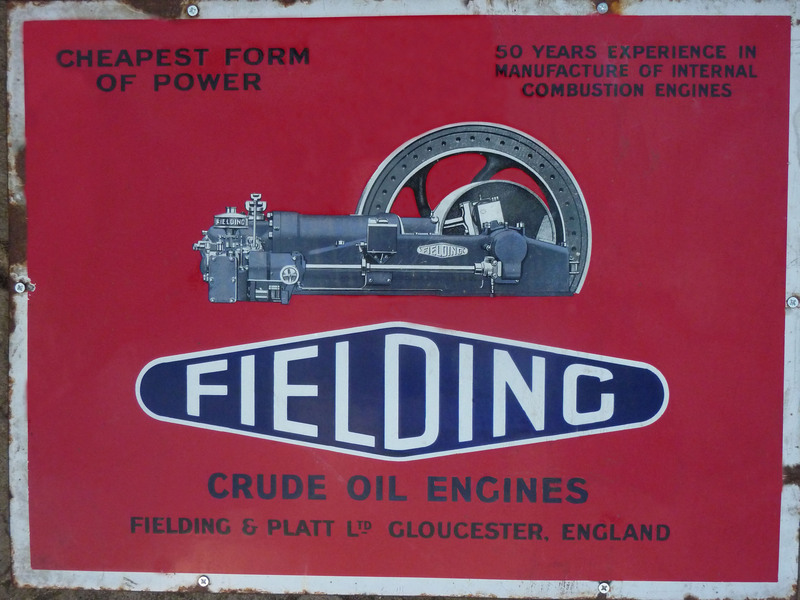 1938 saw the end of the engine business at Fielding and Platt which was sold to Petter that, shortly after, became part of the Brush Group. 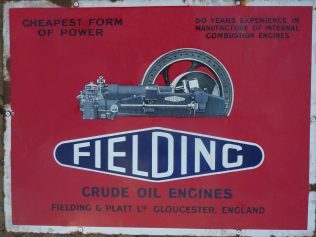 The company was eventually called Petter Fielding. During the war and shortly thereafter, a number of engines were built on contract for Petter. This information has been taken from an article on the History of Fielding and Platt written for me by the late Jack Hobbs from his memory in 1985.